General histories listed on the page for Books about Angus & Kincardineshire, in particular Warden, vol. 5, pp. 33-45. 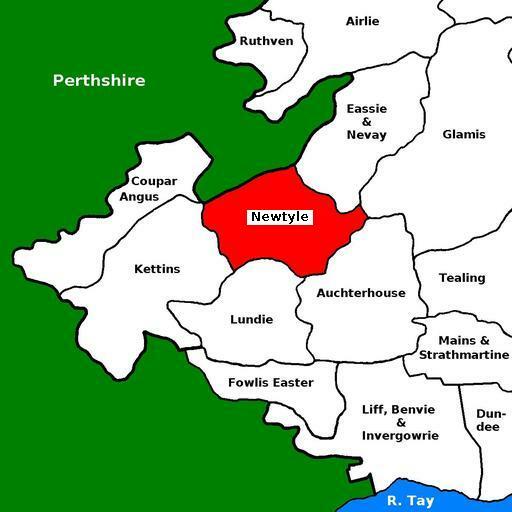 For the full range of maps of Newtyle, see National Library's Maps. Geograph.org: Newtyle - recent photographs of Newtyle. National Grid ref. NO2941. Located at National Grid ref. NO296411. Built ca. 1870. See Newtyle Parish Church for exterior and interior photographs. Edward Miller ?-1901-? b. ca. 1867 Ochiltree AYR; mar. Eliz. H. --, M.B. ; issue: John L.H. The church was closed on 1 Feb 1880. Andrew Jervise recorded some monuments at Newtyle in his "Epitaphs & Inscriptions", vol. 1, pp. 138-41. Newtyle was in the Commissariot of St Andrews.